*This work dates to 2008, but is posted here as it is referenced in the Ethical Jewelry Exposé: Lies, Damn Lies, and Conflict Free Diamonds. Find below the Introduction and section A. For the full 19-page PDF, click HERE. The initial impetus for a working group to establish principles and standards for fair trade manufacturing came from a cross sector ethical meeting sponsored by the Madison Dialogue and the World Bank in Washington DC, in October, 2007. This watershed event brought together representatives from business and civil society, many of whom had been working on their own initiatives. The focus of the meeting was on mining and diamonds issues., it was acknowledged that jewelry manufacturing posed its own unique set of challenges. At the time of the DC meeting, fair trade jewelry or “ethical jewelry” made from a transparent and traceable supply chain was still a relatively new concept within the mainstream jewelry sector. With few exceptions, jewelry sold as “fair trade” was sourced from small cottage industry producers in the developing world. The jewelry was targeted for a low end niche, fair trade market. Yet most everyone recognized that adding the fair trade halo to luxury jewelry products would constitute a perfect “added value” to an item loaded with emotional and symbolic value. Also, many recognized the potential for positive economic develop for the fifteen to twenty million small scale artisan miners through fair trade and beneficiation projects. Fair trade mined product ultimately needed to end up in a fair trade manufactured product. Today, eco friendly, fair trade jewelry as a concept is still in its infancy, even though several initiatives have developed, and mine to market sourcing has become a kind of holy grail. Apart from the internet, a few mainstream jewelry stores in the US and the UK are also marketing their product as fair trade jewelry. Many people across the sector are working in their own areas of expertise to fill in the supply chain gaps. Third party certified fair trade precious metal is very close to entering the market. The market remains chaotic, with various claims being made about jewelry often with little transparency and no standards. But in this chaos is also opportunity. The market is ripe for fair trade jewelry. Given what we have seen in the last ten years in organics and natural products, it only a matter of time before ethical jewelry catches hold. Fair trade manufacturing is the keystone in the process, and the need for principles and standards is greater than ever. Some believe that the term, “fair trade” should be reserved strictly for the producer of raw material, and not the manufacturer. During early discussions, terms such as “fair made jewelry” or “fair produced jewelry” were used to describe what we were trying to achieve. Though we may ultimately brand ourselves with a term other than “fair trade manufacturing,” we are for now simply using this term for the purpose of this document. The impetus for a manufacturing group at the Madison Dialogue meeting came from Marc Choyt, President of Reflective Images Inc, a designer jewelry studio located in Santa Fe, New Mexico. He was joined in an initial steering committee composed of Amanda Stark, at the time, Fair Trade Development Manager for the Rapaport Group; and Demos Takoulas, CEO of Vukani-Ubuntu, a South African fair trade jewelry manufacturing project. This group was later joined by Vivien Johnston, a designer jeweler in Scotland, Director of Fifi Bijoux and head of the British Ethical Jewellery Association. Visits to factories in Thailand, India and Indonesia by a member of the steering committee, strongly enforced the view that, in addition to the market potential of fair trade manufactured jewelry, factories that were exemplary needed greater guidance. Worker safety was a serious problem. 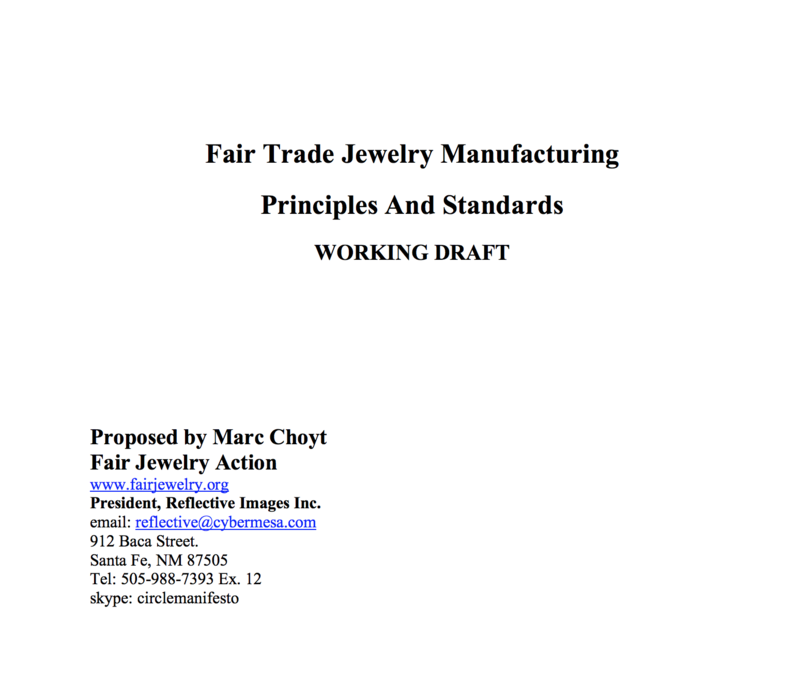 Though excellent principles and standards do exist for general manufacturing, small and medium scale jewelry manufacturing have unique requirements, particularly in the context of fair trade. Using the International Standards and Environmental Accreditation and Labeling Alliance (ISEAL) codes of good practices for establishing environmental standards, the steering committee sought out a diversified group, representatives from various sectors, including but not limited to: manufacturing, civil society, and environmental protection. There were calls for public participation in list serves, websites and in trade publications. The steering committee drafted documents, initiated, and moderated discussions. Recognizing that consensus may not always be possible, it was decided that a two thirds vote would be sufficient to move forward with a decision. In the case that participants had a strong minority opinion, that minority view would also be published. To gain maximizing credibility by creating a transparent and open process, dialogues were to be publicly posted on www.fairjewelry.org, where they remain today under the heading of Manufacturing Standards.